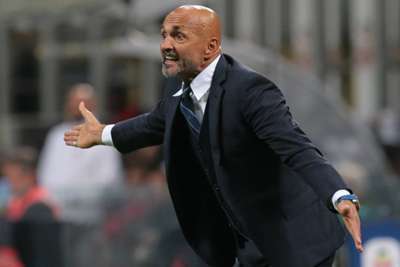 Luciano Spalletti said three Inter players asked to be substituted at half-time as he criticised AC Milan's physical approach after star midfielder Radja Nainggolan was injured. Inter claimed a last-gasp 1-0 Serie A victory over Milan thanks to Mauro Icardi's 92nd-minute header at San Siro but Sunday's derby success appears to have come at a cost. Spalletti fears Nainggolan could be sidelined for "a while" after the Belgian limped off following a heavy tackle from Milan's Lucas Biglia. Speaking post-match, Spalletti told reporters: "Milan are a technical team but they are also as physical a team as we are because they committed many fouls. "They had a very tough approach, and we were penalised by these fouls. "At the end of the first half I had three players that were asking me to be replaced." That was until Milan goalkeeper Gianluigi Donnarumma misjudged Matias Vecino's cross and Inter captain Icardi pounced, heading into an empty net. "The team have played the match they were supposed to play," Spalletti said. "They showed courage, they put their talent into the game, because Vecino's cross is something that was born out of talent, Icardi's goal was born out of talent, and naturally if this is the attitude, you help luck coming your way. "Luck or the possibility to change the score of the game even in the last minutes, because all this always depends on the attitude you have. Everything becomes easier and the crowd is more involved and everything becomes much nicer."